Are Salt and Deicers Harmful? - Legends Landscape Supply Inc. Here in Canada, rock salt and deicers are necessities of life. To live without them, you either have to stay inside for the winter or do a lot of snow shoveling and blowing while hoping for warm, sunny days to melt the remaining ice. Many homeowners worry about the environmental effects of driveway salt and deicers. These are valid concerns, but there are many ways to lessen the impact, especially as new, improved deicers have been developed in recent years. Sodium chloride is the cheapest form of rock salt and is generally very effective, as long as temperatures don’t get exceptionally cold. Traditionally, sodium chloride has been used to deice roadways. It causes corrosion of metals, as almost every car owner knows. High concentrations of salt are harmful to many, but not all plant species. Lawn grasses will suffer from sodium chloride runoff as salt builds up in the soil. Using a high calcium lime on your lawn in the spring will help to counteract some of the impact from salt use. In general, liquid deicers are more environmentally friendly than rock salt. They also work well at lower temperatures. Why? While liquid deicers usually contain some form of chloride, it is typically at lower levels and is less likely to accumulate in your lawn and planting beds. Some liquid deicers are available in small quantities so that homeowners can use them with a hand-held sprayer, but they are predominantly used by medium- large scale snow removal contractors. There are a number of blended deicing products available that use a combination of salts and other chemicals. They are typically very effective at lower temperatures and are designed to be more environmentally friendly. In addition, newer organic compounds are now being used in conjunction with traditional deicing materials. 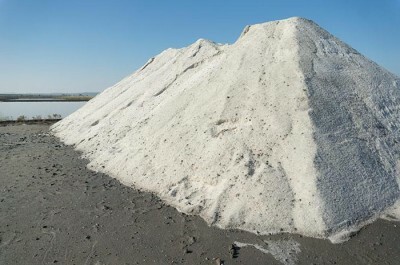 We stock a treated salt that enhances the melting capacity using a byproduct of beet sugar refining. These products are proving to maintain the effectiveness of deicing products while having significantly fewer environmental side effects. Legends Landscape Supply is constantly evaluating new options that are effective. If you use salts and deicers, pay attention to how water drains off your driveway and walks. You can locate ornamental plants where they are least likely to receive salty runoff from paved surfaces. Also, consider adding a river rock or ornamental stone border along the side of your drive and walkway. This will lessen the amount of salt that gets into your lawn. This method is even more effective with six or more inches of washed gravel under the ornamental rock. Conservation is one of the best approaches to environmental issues; it works for deicers and salt, too. Be careful with your application of salt. Don’t use more than you need and try to keep it only on paved surfaces. Lots of deicing products are accidentally spread or splashed onto lawns and planting beds. Balancing cost, effectiveness and environmental concerns is challenging. With proper use and selection of the right product, it is possible to remove ice without harming the environment. If you’re interested in an honest recommendation, contact our team now . As a major supplier of winter products for snow plows and property maintenance companies, our team knows the most effective products and how they should be applied. Written on Thursday, November 14, 2013.